Delay those dreams of a Steam Box competing with a PlayStation, Xbox or Wii. 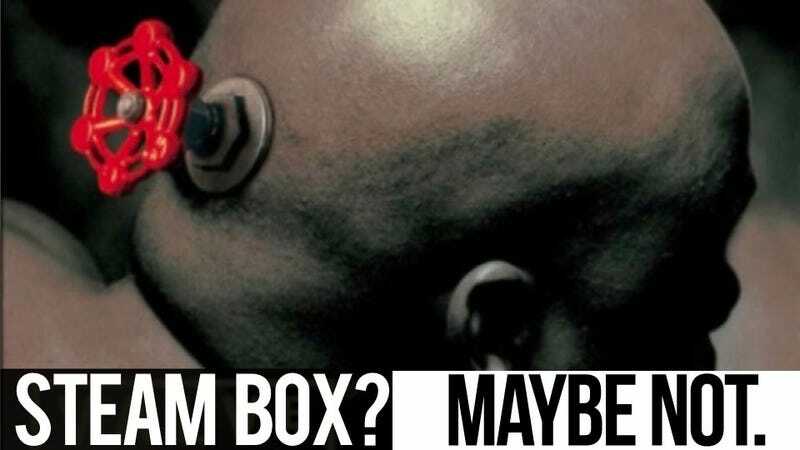 Valve Software is not making a gaming console in the near future and that the various rumors swirling around don't add up to them making their own set-top box. Lombardi refused to flat-out say that Valve isn't working on a console. When I posted it to him this way—"What you're saying is, there's definitely nothing coming any time soon, nothing at GDC or E3, but what you're not ruling out is the possibility that, hey, maybe some day Valve would make hardware," he said, "I think that's accurate." Rumors of an impending Steam Box have heated over the last week, since leading tech site The Verge reported that Valve was working on a console that it would develop in partnership with various hardware manufacturers, similar to Google's approach with the Android platform. Some of the evidence cited were patents for configurable controllers and rumors of an incorporation of Valve's public interest in tracking and reacting to player's biometrics into a Steam console. The Verge report also cited a hardware spec that turned out to match that of a PC built last fall by Valve's Greg Coomer. Could that have been a prototype, we had wondered? Is This a Photo of Valve&apos;s Rumored Console, Or At Least a Prototype? "Greg's one of the guys leading the effort of the Big Picture mode," Lombardi said. "The idea is that you can take Steam to any display. What we're trying to do is say, 'here's a box that we're going to use for testing that's common for Big Picture mode and get performance at a base level.'... We're always putting boxes together. Going all the way back to the Half-Life 1 days, we built special boxes to test our software render… it's just part of development." UPDATE: Some readers speculated that Lombardi was dancing around the possibility that Valve might be partnering with other hardware makes who would be shipping a possible Steambox. I double-checked with Lombardi. Whether we're talking about Valve making hardware or partnering with others, nothing like that is happening any time soon, he said.